Samsung’s Galaxy Note 9 will launch in New York City in a little over a month, and leaks for the device just don’t want to stop. Right now, we don’t expect any radical changes on the phablet, aesthetically or otherwise. Samsung’s rumored to take the iterative approach once again, as the Korean tech giant looks to refine the Note 9’s features. Leaks and rumors have shown a horizontal rear dual camera setup with the fingerprint sensor under it as some of the only external changes on the upcoming Samsung Galaxy Note 9. Now, after several live image leaks for the device, we’ve got its first live video leak. So if you’re eager to find out what the Galaxy Note 9 will look like, take a look below for more details. The majority of leaks and reports for the Samsung Galaxy Note 9 that have surfaced so far relate to its form and design. Few cater to specifications and even fewer provide us with critical feature upgrades that Samsung might use as selling points. The company’s Galaxy S9 lineup has performed dismally this year in terms of units shipped and therefore, the company has got a lot of pressure heading into its launch event set to take place on the 9th of this month. With this in mind, we’re afraid that the company might not make the mark with the Galaxy Note 9. So far, the only truly attractive feature for the gadget that’s surfaced is a major upgrade to its S-Pen. The stylus will now double down as a remote-control accessory for the device. It will allow users to control Note 9’s volume, camera timer and also feature a laser-pointer to facilitate corporate users in their presentation. Additionally, another major upgrade that’s mentioned by a lot of sources is for the Note 9’s battery. Samsung will introduce a larger power pack on the gadget, with a 4000mAh capacity. This is another change directly aimed towards business users. Now, the Galaxy Note 9’s first live video leak corroborates nearly every external and design related detail for the device that has surfaced over the past couple of months. As you can see above, the Galaxy Note 9 will feature a horizontal dual rear camera setup with the fingerprint sensor now under it. Given the amount of fakes out there, a chance of this device being similar does exist. However, some images of a Note 9 copy that surfaced earlier featured color tone differences for the logo and the camera setup. These are not present in today’s device. Additionally, it’s source is authentic as well, having shared several relevant and accurate details in the past. 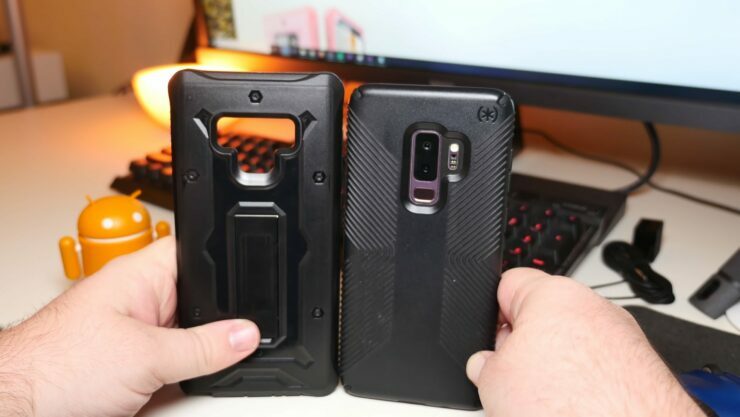 This video is a Note 9 prototype for case manufacturers, and the device itself features razor sharp top bezels – a fact that undoubtedly deserves applause. In fact, one rumored upgrade to the Note 9 is smaller top and bottom bezels owing to improved manufacturing processes. The Galaxy Note 9 is also reported to ship with an 8GB RAM variant, that will also feature 512GB of internal storage. This, when combined with a 4000mAh battery will prove as a godsend for many users. But, don’t get your hopes up as right now, this variant is expected to ship only to South Korean customers. Thoughts? Let us know what you think in the comments section below and stay tuned. We’ll keep you updated on the latest.